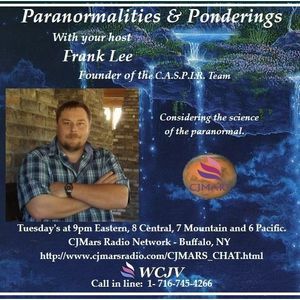 Paranormalities & Ponderings Radio Show featuring guest Tim Woolworth! Join us for an amazing show with paranormal researcher, founder of ITC Voices, writer, speaker, and ghost box chronicler, Tim Woolworth, as he shares his knowledge and experience of all things ITC, ghost boxes, and more! It started with my mother as she had books on demonology, witchcraft, hauntings and all things esoteric in the house - Fate Magazine was bathroom reading material! From the age where I could first start reading independently, I would go through her books and absorb it all. Ghost boxing changed for me in Gettysburg. I was there in March, 2010, and I recorded one of the clearest ghost box sessions ever recorded. It was also the first time a crossing over session with intelligent responses was ever recorded in real time by anyone. This changed my entire outlook on the paranormal and the role we play as paranormal investigators. A month later, I launched the site ITC Voices to promote ghost box ITC to the world.